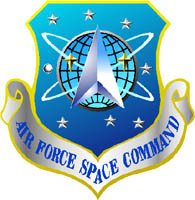 Air Force Space Command (AFSPC), created Sept. 1, 1982, is one of nine Air Force major commands, and is headquartered at Peterson Air Force Base, Colo. AFSPC defends America through its space and intercontinental ballistic missile (ICBM) operations, vital force elements in projecting global reach and global power. AFSPC is a key factor in implementing the expeditionary aerospace force organizational structure. Space control ensures friendly use of space through the conduct of counterspace operations encompassing surveillance, negation and protection. Force enhancement provides weather, communications, intelligence, missile warning and navigation. Force application involves maintaining and operating a rapid response land-based ICBM force as part of the nation's strategic nuclear triad. Approximately 37,200 people, including 25,800 active-duty military and civilians, and 11,360 contractor employees, combine to perform AFSPC missions. Air Force Space Command has two numbered air forces. Fourteenth Air Force provides space warfighting forces to U.S. Space Command, and is located at Vandenberg AFB, Calif. Fourteenth Air Force manages the generation and employment of space forces to support U.S. Space Command and North American Aerospace Defense Command (NORAD) operational plans and missions. Twentieth Air Force, located at F.E. Warren AFB, Wyo., operates and maintains AFSPC's ICBM weapon systems in support of U.S. Strategic Command war plans. AFSPC is the major command providing space forces for the U.S. Space Command and trained ICBM forces for U.S. Strategic Command. AFSPC also supports NORAD with ballistic missile warning information, operates the Space Warfare Center to develop space applications for direct warfighter support, and is responsible for the Department of Defense's ICBM follow-on operational test and evaluation program. 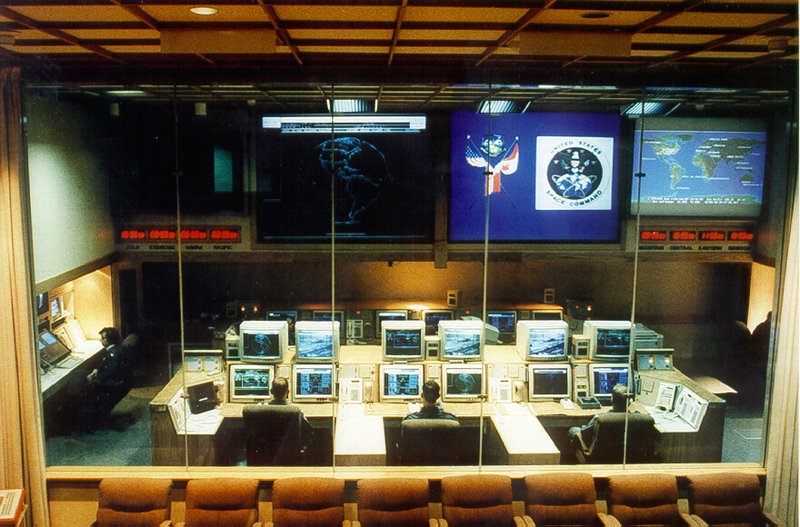 AFSPC bases and stations include: Cheyenne Mountain Air Station, 21st Space Wing Schriever and Peterson AFBs and Buckley Air National Guard Base, Colo.; 30 Space Wing Onizuka AS and Vandenberg AFB, Calif.; Space Operations Squadron Cape Canaveral AS and Patrick AFB, Fla.; Cavalier AS, N.D.; F.E. Warren AFB, Wyo. ; Malmstrom AFB, Mont. ; Clear AS, Alaska; Thule AB, Greenland; and Woomera AS, Australia. AFSPC units are located around the world, including Japan, the United Kingdom and Germany. AFSPC operates and supports the Global Positioning System, Defense Satellite Communications Systems Phase II and III, Defense Support Program, NATO III and IV communications and Fleet Satellite Communications System UHF follow-on and MILSTAR satellites. AFSPC currently operates the Atlas II, Delta II, Titan II and Titan IV launch vehicles. This includes all of the nation's primary boosters from the Eastern and Western ranges and range support for the space shuttle. AFSPC also operates the nation's primary source of continuous, real-time solar flare warnings. The command also operates a worldwide network of satellite tracking stations to provide communications links to satellites -- a system called the Air Force Satellite Control Network. Ground-based radars used primarily for ballistic missile warning include the Ballistic Missile Early Warning System, PAVE PAWS and PARCS radars. 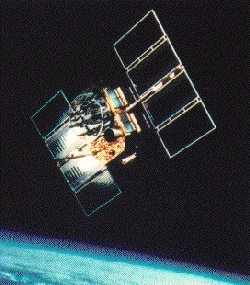 The Ground-based Electro-Optical Deep Space Surveillance System, Passive Space Surveillance System, phased-array and mechanical radars provide primary space surveillance coverage. The ICBM force consists of Minuteman III and Peacekeeper missiles that provide the critical component of America's on-alert strategic forces. As the nation's "silent sentinels," ICBMs, and the people who operate them, have remained on continuous around-the-clock alert since 1959 -- longer than any other U.S. strategic force. Five hundred Minuteman III and 50 Peacekeepter ICBMs are currently on alert in reinforced concrete launch facilities beneath the Great Plains. 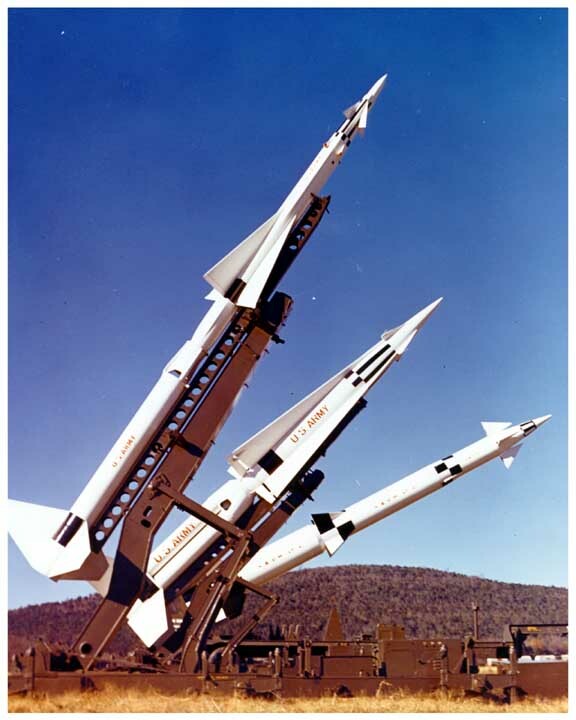 Nike-Zeus was one of the first U.S. efforts whose objective was to develop long range defenses against ballistic missiles. The logic driving the program called for an exoatmospheric (60 miles or higher above the earth's surface) or very high altitude, long range interceptor carrying a 400 kiloton nuclear warhead that, when detonated, would destroy incoming missiles. While rocket science had put the concept within reach, the tracking radars were still too primitive to cope with a large number of missiles. The radars could be spoofed by countermeasures such as chaff and decoys, and were physically vulnerable. The tight defense budgets of the 1950s also acted as a restraint since a widely deployed system would be costly. Under President Kennedy, Nike-Zeus was canceled in 1961 and replaced by Nike-X. This program incorporated three major advances: a phased-array, electronically guided radar; a new short-range nuclear tipped interceptor called Sprint, and an upgraded Nike-Zeus missile renamed Spartan. Nike-X, in turn, was superceded by Sentinel in 1967. Recognizing that the U.S. could not stop an all-out attack by Soviet ICBMs, the Johnson Administration elected to proceed with a "thin" anti-ballistic umbrella designed to protect major U.S. cities. When Secretary of Defense Robert McNamara announced the plan in September 1967, he made two points that have become part of the current debate about 21st century U.S. national missile defense: (1) attempts to deploy a comprehensive ABM system will only fuel the offensive missile race, and (2) what is needed is enough of an umbrella to counter very limited threats such as that posed by the small Communist Chinese ICBM fleet. The Nixon Administration refocused the Sentinel system from guarding cities to guarding vital military locations by employing as many as twelve ABM sites. Renamed Safeguard, the system would provide protection to Minuteman ICBM missile fields, Strategic Air Command bases, and the National Command Authority in Washington, DC. In August 1969 the Senate approved initial deployment on a tie vote broken by the Vice President. In the Treaty on the Limitation of Anti-Ballistic Missile Systems the United States and the Soviet Union agree that each may have only two ABM deployment areas, so restricted and so located that they cannot provide a nationwide ABM defense or become the basis for developing one. Each country thus leaves unchallenged the penetration capability of the others retaliatory missile forces. Precise quantitative and qualitative limits are imposed on the ABM systems that may be deployed. Both Parties agreed to limit qualitative improvement of their ABM technology. The ABM Treaty was signed at Moscow May 26, 1972, and ratified by the US Senate August 3, 1972. It entered into force October 3, 1972. The US and the USSR signed a Protocol to the treaty which entered into force in 1976 which reduced the number of ABM deployment areas from two to one, deployed either around each parties national capital area or, alternatively, at a single ICBM deployment area. The USSR deployed an ABM system around Moscow. The Treaty has subsequently been extensively modified by amendment, and various common understandings and protocols. Five-year review meetings are held in Geneva. On October 1, 1975 the Grand Forks site became operational. The next day, the House of Representatives voted to close the system down because the Soviet program to put multiple independent reentry vehicles (MIRV) on their missiles meant that Safeguard would be easily overwhelmed. Furthermore, it was finally recognized that the radars that were part of the system would be blinded by the electromagnetic pulse from exploding nuclear warheads on the Safeguard interceptors. The Senate concurred with the House action in November, and in February 1976 the system went into "caretaker" status after only four months of operation. Except for its supporting radar, Safeguard was closed completely in 1978. This was the state of play when, on March 23, 1983, in five paragraphs near the end of a televised nationwide address, President Reagan conveyed his vision of how the U.S. could counter Soviet ICBMs by developing defenses that would make "nuclear weapons impotent and obsolete." Mr. Reagan conceded that some other nations might regard defensive measures "paired with offensive systems. . . as fostering an aggressive policy"-a concern that remains to this day. Congressional charges that this futuristic "star wars" scheme was nothing more than another excuse to increase defense spending had little impact. 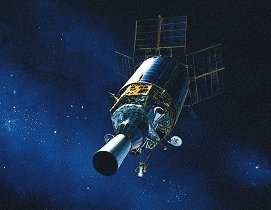 The Strategic Defense Initiative (SDI) was born. In 1985 the Pentagon's SDI Organization (SDIO) proposed a multi-layer, space-based system to defend 3,500 "targets" against Soviet missiles. By 1987 the reality of technological limitations had set in, and many anti-missile concepts were abandoned as unworkable. Nonetheless, with about $4 billion per year being spent on SDI, the program anticipated a deployment decision in 1993 and initial operational status by 1997 employing both ground and space-based interceptors. But by 1992 the Warsaw Pact had disintegrated and the Soviet Union imploded. Under President Bush, the idea of a nationwide defense against a massive Soviet missile strike was abandoned in favor of Global Protection Against Limited Strikes or GPALS. This envisioned an integrated system that would provide protection against tactical/theater missiles as well as up to 200 nuclear warheads mounted on land or sea launched intercontinental ballistic missiles. When the Clinton Administration came to power in 1993 SDIO became BMDO-the Ballistic Missile Defense Organization. Estimates that Iraq had been within 6 months of having a nuclear weapon with which it could have attacked its neighbors or used to blackmail the United States fueled the psychology of missile defense, particularly deployable theater defenses. When the Republicans gained control of both Houses of Congress in 1995, the stage was set for a major push not just for developing and deploying theater systems but for a National Missile Defense (NMD) system, to be deployed by 2003. Technological setbacks caused this date to slip to 2005, which is also the year by which, according to a 1999 National Intelligence Estimate, North Korea could field a missile capable of hitting the U.S. homeland. But in late 1999 North Korea agreed to a moratorium on developing its Taepo Dong 2 ICBM, leading a number of analysts to add a year to the "threat development" time line. Concurrently, in mid-2000, retired Air Force General Larry Welch, the head of the National Missile Defense Independent Review Team created by the Pentagon to evaluate NMD, told the Senate Armed Services Committee that NMD's "high risk" made a 2005 deployment "unlikely." On September 1 2000, President Clinton announced his decision against authorizing the Pentagon to proceed with NMD deployment. He cited three major concerns: 1) the status of technology (one hit in three tries); 2) the refusal of Russia to agree to modify the Anti-Ballistic Missile Treaty to permit deployment of an NMD system; and 3) the reluctance of our closest allies-especially those on whose territory early warning radars would be sited-to endorse NMD unless the Anti-Ballistic Missile Treaty were to be modified, thus preserving strategic nuclear stability. The President reaffirmed that NMD is needed as part of a comprehensive national security strategy that considered all threats including terrorism and other means of delivering nuclear, chemical, and biological weapons. He said that his decision would not further delay the program as "experts" projected that the technology would not be ready for deployment before 2006 or 2007-allowing a delay in the deployment decision until Autumn 2001 or 2002, well into the term of the next president. The Strategic Defense Initiative (SDI), also known as `Star Wars', is a global name to describe a series of space based defense systems. SDI defense begins with the launch of an opponents ICBM. To understand how technologies can be applied to SDI, one must first understand the process in firing an ICBM. There are four main phases in the path of an ICBM, with total flight time taking about 30 minutes. 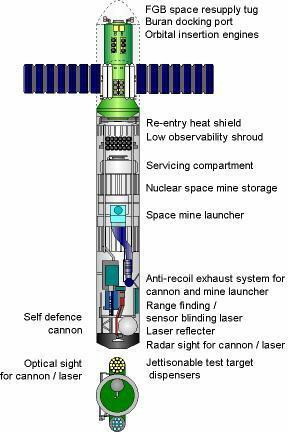 Therefore, a SDI system has only a half-hour to detect and destroy possibly many ICBMs, and even more warheads when MIRV technology is used. The first phase is called the boost phase and lasts two to five minutes. Each stage of the three-stage ICBM is consecutively burned out then jettisoned. This is the best time for SDI to destroy the ICBM, since it is easy to detect the infrared (heat) emissions of the boosters and also everything (multiple warheads, decoys, and distraction aids) are all still in one package. After the third stage finishes burning, the second phase begins with the bus (the post-launch vehicle contained in the nosecone) containing the warheads, decoys, and aids being propelled into space. It is steered by small jets as it empties its contents. Phase three is the midcourse phase, in which the warheads and decoys spend about 20 minutes flying through space to their destination. Phase four is called the terminal phase, in which the warheads reenter the atmosphere. The lighter decoys are destroyed and the real warheads spend one half to several minutes travelling to their respective targets. KKVs rely on the direct impact collision between a projectile and its target. There are no explosives involved, as the impact destroys the warhead. One type of KKV that was investigated is the electromagnetic rail gun. It uses electricity to produce electromagnetic forces to propel a projectile, possibly up to 10-12 miles per second. 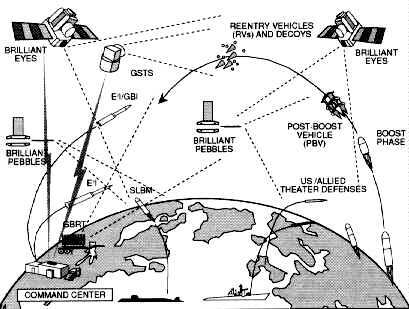 Another type of KKV was tested by the US's Homing Overlay Experiment (HOE) in June 1984. An ICBM was launched which carried an interceptor missile above the atmosphere, and then released it. This missile then used heat sensors and an onboard computer to destroy a dummy warhead, therefore considering the experiment a success. Some have also suggested carrying rockets aboard satellites or firing large amounts of rockets, called swarmjets, at incoming warheads during the last phase. Some KKVs, like the missile/ICBM combo used in the HOE test, are operational and closest to possible deployment. Another major category of researched SDI weapons were lasers, defined as Light Amplification by Simulated Emission of Radiation. If laser stations could be based in space, there would be no atmospheric degradation of the laser beam. Some advantages in attacking ICBMs are that lasers offer almost instant attack as light travels at 300,000 km/s and that the laser could travel thousands of miles without begin degraded. There are three ways to destroy an ICBM with lasers. One way is to focus a hot beam on the surface to burn a hole or weaken the structure, which would cause the ICBM to self-destruct. Another way is to "pulse" the laser so that it may push a shock wave through the target, which could knock it off course. Also, a laser could disturb fragile guidance or detonation electronics, causing the reentry vehicle (RV) to malfunction. Types of lasers that could be used for SDI included the chemical laser, which gets energy from the chemical interaction of gases. An example is the "excimer" laser. Another type is the free-electron laser, which uses a large particle accelerator to generate electrons, which are then passed through a magnetic field and emitted as ultraviolet light. However, lasers have great power requirements with power sources weighing tons, so delivery into orbit is very difficult. Also, they are vulnerable to attack by anti-satellite weapons (ASATs). For these reasons, it was suggested that lasers could be ground based and deflected by orbiting mirrors to hit the target. Because of many apparent problems with lasers, CPBs were suggested as an alternative or for use in another layer of defense. Other proposed technologies are based upon particle beams. While the emission of lasers is light, CPBs emit a beam of concentrated subatomic particles in the form of radiation. R&D in this area was in its infancy, as researchers hadnt even decided on the most effective type of beam. The best beam appeared to be the neutral-particle beam, composed of neutrons and gamma rays. A neutral beam is better than a charged beam because gravity and electromagnetic fields do not affect it. Even just the earths magnetic field would bend a charged beam into uselessness. However, even a neutral beam must only be used in space, as passage through the atmosphere would charge the particles. Problems with the beam were how to form an effective beam and have it travel across space. Such work had been achieved successfully, but only on relatively small scales. CPBs ruin ICBMs by penetrating the outer shell and scrambling guidance and detonation mechanisms, rendering the missile useless. There appeared to be no countermeasures to CPBs, as shielding is much to heavy for the ICBM to carry. R&D on both DET systems never resulted in any kind of primitive prototype, so it was never known if such an SDI system would ever be effective. Instead of R&D being concentrated on technologies that were feasible, many researchers wasted time and money dreaming up ideas for the future. One such dreamt-up SDI laser weapon was the nuclear-pumped x-ray laser, which cant be shot down by ASATs like with satellites and mirrors. When an ICBM launch is detected, the vehicle, containing a nuclear bomb, is fired into space. It is then detonated and uses the nuclear energy from its own explosion (have fun harnessing that!) to emit x-ray lasers just before it is annihilated. Other weapons include gamma-ray lasers and "plasmoids". Gamma lasers are more lethal than x-ray lasers and the power source was also suggested to be a nuclear explosion. Plasmoids involve hurling clouds of energized atomic nuclei and electrons into the path of incoming warheads. There was also the idea of the HEL/CPB combo. A laser ionizes a channel in the atmosphere for the charged beam to travel along to the target. However, charged beams bend and are thus useless. One last idea was based on the Advanced Test Accelerator research at the Lawrence Livermore Laboratory. They had created a form of artificial lightning from pulses of electrons, which may have had SDI applications if it could be made to fire thousands of miles precisely instead of several feet randomly. Any successful SDI system would require a massive core supercomputer to handle the great amounts of complex data and coordinate all of the systems and sub-systems in just minutes. Such a system, and the software required to run it, seems overwhelming. Nothing technically operational was ever developed, but the basic architecture was laid out by the terms C3I and SATKA. C3I stands for the command, control, communications, and intelligence network required to control the whole SDI battle from the initial warnings to the final assessment. SATKA refers to the basic function performed by various ground and space-based devices. S is for the continual surveillance of Soviet ICBM launches with the use of geosynchronous satellites with infrared detection systems. A stands for the acquisition of the attacking ICBMs positions and trajectories. T is for the tracking of the targets as they move through the four phases of an ICBMs flight. The KA stands for kill assessment, which decides which warheads have been destroyed or disabled. A fully developed SDI system would need at least four layers of defense, so that incoming ICBMs could be fired upon at each phase, increasing the probability of eliminating them. The Polyus testbed contained means of defence against both ASAT weapons and beam weapons, though according to Kornilov's article these were only meant to conduct approach and docking tests. A cannon was mounted on Polyus to defend against ASAT weapons. An optical sighting system for the defensive cannon was included in addition to a sighting radar. By this means hostile ASAT weapons could be tracked without generating traceable signals. Experiments to check the efficiency of barium clouds in diffusing particle beams were also to have been conducted with Polyus. A Polyus mock-up was delivered by the Krunichev Factory to Baikonur Cosmodrome in July, 1986, for tests of the Polyus/Energia interface. The spacecraft was about 37 meters in length, 4.1 meters in diameter and weighed about 80 metric tons. A question exists whether a mock-up of the Polyus test bed was constructed and if it still exists. 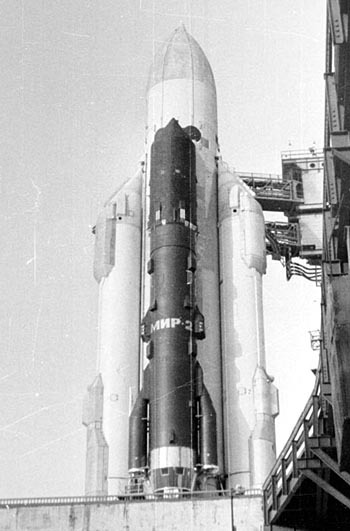 There have been several schemes advanced by the Salyut Design Bureau and the Krunichev Factory for the commercial adaptation of Polyus and these may be intended to make use of this mock-up. Polyus's failure to achieve working orbit was caused by a faulty inertial guidance sensor. In the rush of construction an already built sensor had been stripped from an existing Cosmos spacecraft and then been inadequately tested, as the Polyus mock-up had been shipped to Baikonur by the time the test equipment arrived at the Krunichev Factory. Those responsible for the failure were immediately fired or demoted. What are the goals and structure of the US Space Command? What is an anti-ballistic missile defense and why is it destabilizing? What is the goal of SDI and some of its main components?